Based on Google Earth and Geocaching (the exciting GPS adventure where players find real-life, hidden “treasures”), the innovative activities in this book will introduce, reinforce, and enrich concepts taught in life, earth, and physical sciences. Lessons include teaching procedures, standards alignments, student activity sheets, product samples, answer keys, and lesson extensions. Each lesson is customizable by modifying the files on the included CD-ROM. Aligned with the ISTE and NSCC. 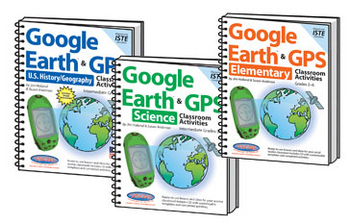 Based on Google Earth and Geocaching, the innovative activities in this book introduce and reinforce concepts taught in the four major elementary school subjects. The lessons over concepts such as interpreting graphs/charts & using fractions (math), reading thermometers & labeling landforms (science), practicing cardinal directions & labeling earth (social studies), differentiating between fact and opinion & finding the main idea (language arts), and many more. Lessons include teaching procedures, student activity sheets, product samples, answer keys, and lesson extensions. Each lesson is customizable by modifying the files included on the CD-ROM. These lessons are sure to motivate students and invigorate your lessons! Ready-to-use lessons for math, science, social studies, and language arts! Aligned with ISTE standards. Based on Google Earth and Geocaching (the exciting GPS adventure where players find real-life, hidden “treasures”), the innovative activities in this book will introduce, reinforce, and enrich concepts taught in U.S. History and Geography (from early beginnings through Reconstruction). Lessons include teaching procedures, standards alignments, student activity sheets, product samples, answer keys, and lesson extensions. Each lesson is customizable by modifying the files on the included CD-ROM.